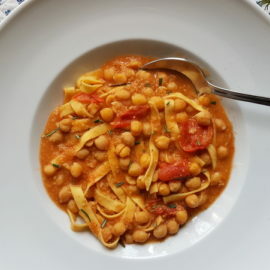 Lagane with chickpeas is one of the oldest known pasta recipes! Here in Italy, there are many ancient recipes handed down from generation to generation which still bring the flavours of the past to today’s table. Lagane with chick peas is definitely one such dish. In fact, the Roman poet Horace wrote about a soup of lagana (lagane) and chickpeas which he ate in his home town, Venosa in Basilicata! That’s how old this recipe is! Although Horace would have eaten a version without tomatoes, which were unknown in Italy then. Apparently in some very old recipe books lagane with chickpeas is also called the plate of the Brigands (il piatto dei Briganti). It is said that in the second half of the nineteenth century, the forests of Monte Vulture, an extinct volcano in Basilicata, were invaded by brigands who loved to eat large quantities of this pasta! 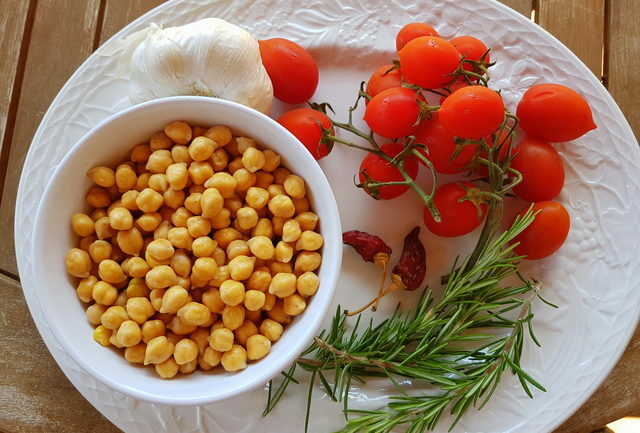 Typical of Southern Italy, lagane with chickpeas is very popular in Basilicata, Calabria, Campania and Puglia. However, there are a number of variations of this dish in the South; with or without tomatoes, with or without bacon, with or without lard etc. Some recipes are more like a soup, others are drier. 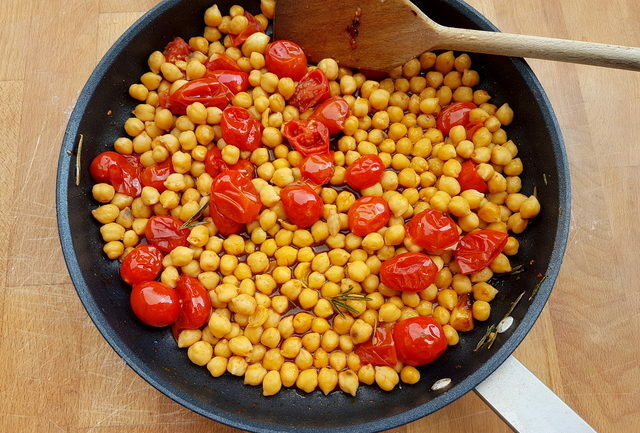 Lagane with chickpeas is both nutritious and tasty! In general, this is more a cold weather recipe as it’s pretty filling and warming, but even the simplest version can also be eaten as a main course or one course meal at any time of the year (Italians often eat pasta as a starter!). This dish provides adequate amounts of all nutrients and healthy proteins, thanks to the combination of legumes and cereals, and has an optimal amount of cholesterol-lowering fibre. In order for this dish to be really healthy, however, it is better to use dry chickpeas, as I did. This of course increases the time it takes to make this recipe. Dry chickpeas need to be soaked for 12 hours and then cooked for one to one and a half hours. 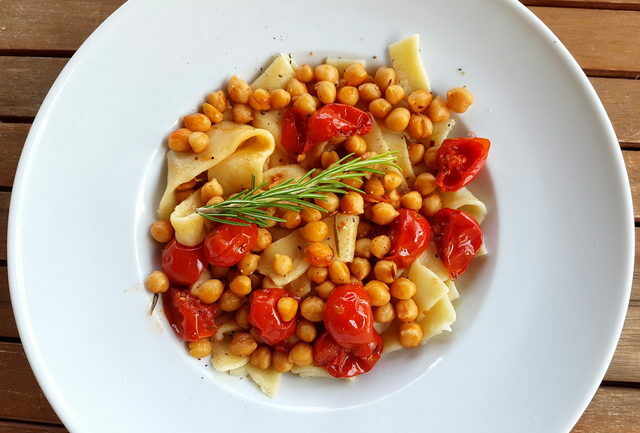 You can, of course, use canned chickpeas to cook a faster more convenient version, but you will also lose out on taste as pre-soaked and cooked dry chickpeas are far more flavourful. Canned chickpeas may also contain more sodium and unless you purchase canned chickpeas in cans labeled “BPA-free,” you’ll be exposed to bisphenol A, or BPA. Yes, I made the pasta by hand! 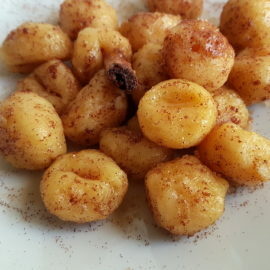 As I mentioned before, there are a number of different ways to cook lagane with chickpeas. This recipe comes from Basilicata and includes tomatoes. I also made the pasta by hand (much to my husband’s delight!!) Lagane is usually made by hand in Southern Italy and very few pasta makers produce a dried version. Although I have seen some available online, I couldn’t find it in the supermarkets here in the North. 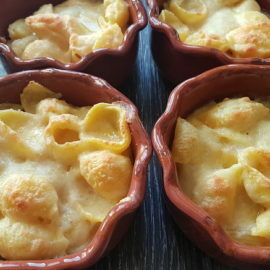 I wanted to make this dish with the typical pasta used in Basilicata, so that’s why I decided to make it myself! I am really glad I did! It was excellent! 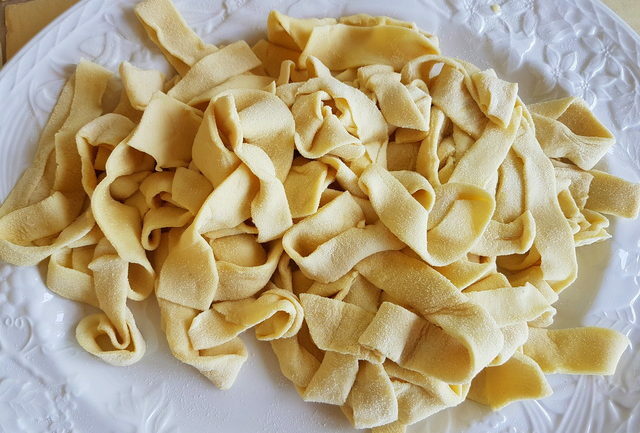 But, if you prefer to use dried or ready made fresh pasta you can also use tagliatelle, pappardelle, lasagnette or cavatelli. Whichever pasta you use, you are sure to love this recipe. As a footnote, I had a lot of left over chickpea and tomato sauce, which we ate the next day as a salad (without pasta) It was really good! So, I got 2 dishes for the price and work of one! What an interesting combination using chick peas with pasta. Your homemade noodles look amazing! 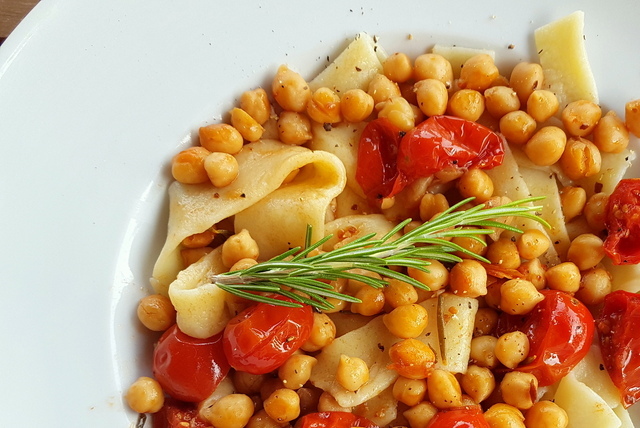 Chickpeas and pasta are a very traditional combination here in Italy, which dates back to Roman times! I’m sure you’d love it Alisa! I am obsessed with chickpeas!! And I know, I should probably make them from dry. But I always forget and want an easy, last minute chickpea dinner. During the summer, I will definitely cook them myself! This looks like an amazing recipe. Your noodles look absolutely delicious. making pasta from scratch is the way to go!! This is such a delicious and simple pasta dish. This looks wonderful so light but satisfying all at the same time… I love making pasta at home, we have ducks and their eggs make for the most wonderful egg pasta. I remember the last time we visited Italian Restaurant here in our place. We had Lagane with chickpeas and we really liked it. So delicious and flavourful. It is one of the best pasta we tasted ever. Now I can’t wait to try this recipe. I’ve never seen a pasta recipe with chickpeas, but i’ve recently fallen in love with chickpea butter! I love this so much! Can’t wait to try it! Can you recommend a peperoncino substitute? I can find pickled, but not fresh or dried.peperoncino. 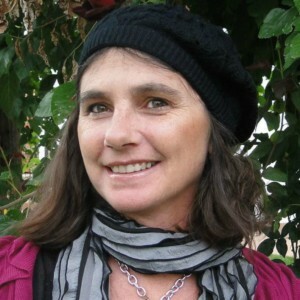 Hi Linda, peperoncini literally means chili pepper or spicy capsicum annuum. In Italy we use mostly red ones, but green are also used.The pepper needs to be moderately spicy but not outrageously hot. You may also use cayenne peppers which are practically the same as the Italian peperoncino. Cayenne pepper can be bought fresh, dried or as a powder in most places. Italian peperoncino can be bought online from different companies including Amazon.com in different forms (dried, flakes, powder etc). I wouldn’t use preserved in vinegar but preserved in oil can be used for most recipes too. The best Italian ones come from Calabria so if you find them online go for those. Do let me know if you succeed in finding them. Best regards from Verona!